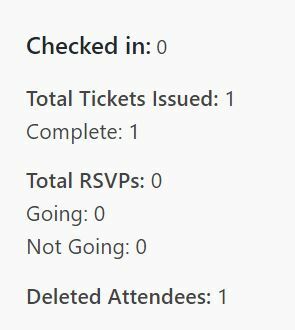 Just tried adding our first event and tested the ability to remove an attendee. I have Deleted their Ticket. I was expecting their ticket to be restocked and return my capacity back. This has not occurred. Is there some type of condition needed for a delete ticket action to restock? And here is the status in the Attendees panel. I’m sorry that you’re running into this issue, but I’ll be happy to help you out. When you delete an attendee, the stock for that attendee’s ticket should increase by 1, but the “Total Tickets Issued” number will not change, as the ticket was still issued even though it was later deleted. Can you take a look at the WooCommerce product for this ticket and see if the stock was increased there? You can access this by going to the ticket edit section on your event, editing the ticket, expanding the “Advanced” section, and clicking the “Edit ticket in WooCommerce” link. I do want to note that if you are using shared capacity for this ticket, that stock (the overall ticket stock for that event) will not be updated automatically when you delete an attendee. Only the individual ticket stock will be updated. Woocommerce stock number went back up to 30 (in Woocommerce-Product view). individual ticket. Is this what you expect? This is the expected functionality at the moment (although we do have an internal ticket open to consider changing this functionality). The reason for this is that since the shared capacity applies to all tickets on the event, some users might not want this to automatically increase when the attendee for one ticket is deleted. For now, you will need to adjust the shared capacity manually. I’m sorry I don’t have a better solution for you at the moment, but I hope this helps clear things up! Please let me know if you have any additional questions.